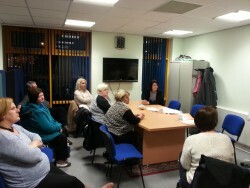 On Friday, 6th of February 2015, a Dementia Session was delivered by Emmanuel Williams from Dementia Friends and Marta Bruzgul from Making Space at Bosnian and Herzegovina Centre. Making Space is the Charity Organization which provides different activities for people who have been diagnosed with any kind of Dementia. We all learned a little bit more about what it is like to live with Dementia and turn that understanding into action. The session was very informative, educational and interesting.